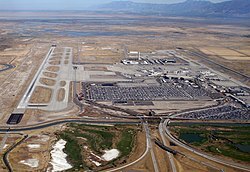 Salt Lake City International Airport (IATA: SLC, ICAO: KSLC, FAA LID: SLC) is a civil-military airport located about 4 miles (6.4 km) west of Downtown Salt Lake City, Utah in the United States. The airport is the closest commercial airport for more than 2.5 million people and is within a 30-minute drive of nearly 1.3 million jobs. The airport is the fourth-largest hub for Delta Air Lines, as well as a hub for Delta Connection carrier SkyWest Airlines with nearly 300 daily departures. Following Delta, the largest carriers are Southwest Airlines, American Airlines, and Alaska Airlines. The airport sees 343 scheduled nonstop airline departures per day to 93 cities in the United States, Canada, Mexico, and Europe. Salt Lake City International Airport continues to rank high for on-time departures/arrivals and fewest flight cancellations among major US airports. The airport ranked first for on time departures and arrivals and first for percentage of cancellations as of April 2017. The airport is owned by City of Salt Lake City and is administered by the Salt Lake City Department of Airports. In 1911, a site for an air field was chosen on Basque Flats, named for Spanish-French sheep herders who worked the fields in the then-desolate area of the Salt Lake Valley, where a cinder-covered landing was subsequently created. The Great International Aviation Carnival was held the same year and brought aviation pioneers representing Curtiss Aeroplane and Motor Company and a team representing the Wright Brothers to Salt Lake City. World-famous aviator Glenn H. Curtiss brought his newly invented Seaplane to the carnival, a type of airplane that had never been demonstrated to the public. Curtiss took off from the nearby Great Salt Lake, awing the 20,000 spectators and making international headlines. For several years, the new field was used mainly for training and aerobatic flights. That would change in 1920 when the United States Postal Service (USPS) began air mail service to Salt Lake City. The airport expanded and hangars and other buildings began to appear. In the same year, the airfield was given the name Woodward Field, named for John P. Woodward, a local aviator. In 1925, the postal service began awarding contracts to private companies. Western Air Express, the first private company to carry U.S. mail, began flying from Salt Lake City to Los Angeles via Las Vegas. Less than a year later Western Air Express would begin flying passengers along the same route. Western Air Express later became Western Airlines, which had a large hub in Salt Lake City. Charles Lindbergh visited Woodward Field in 1927, drawing many spectators to see The Spirit of St. Louis. During the next few years the airport would gain another runway and would span over 400 acres (1.6 km2). In 1930 the airport was renamed Salt Lake City Municipal Airport. The first terminal and airport administration building was built in 1933 at a cost of $52,000. By then, United Airlines had begun serving Salt Lake City on flights between New York City and San Francisco. As air travel became more popular and the United States Army Air Forces established a base at the airport during World War II, a third runway was added (Runway diagram for 1955). The April 1957 OAG (formerly the Official Airline Guide) shows 42 weekday departures: 18 on Western, 17 United and 7 Frontier. United had flown nonstop to Chicago since 1950, but a New York nonstop didn't start until 1968. The first jets were United 720s in September 1960. A new terminal was needed and work began on the west side of the airport on Terminal 1, designed by Brazier Montmorency Hayes & Talbot and dedicated in 1960 after seven years of work and a cost of $8 million. In 1968 the airport became Salt Lake City International Airport when a non-stop route to Calgary, Canada was awarded to Western Airlines. After airline deregulation in 1978, hub airports appeared. Western Airlines, with ties to Salt Lake City since its inception, chose the airport as one of its hubs. Terminal 2 was designed by Montmorency Hayes & Talbot and built solely for Western and had several murals by artist LeConte Stewart. In 1991 the airport opened a new short-term parking garage. The airport opened a new runway in 1995 along with the International Terminal and E concourse for SkyWest Airlines, which was designed by Gensler. A new 328-foot-tall (100 m) control tower, new approach control facility, and a new fire station were opened in 1999. Recently the airport has upgraded its access roads and parking facilities in preparation for a new terminal. The airport has made minor upgrades to the terminals and concourses including expansion of baggage claim facilities. In June 2008, Delta Air Lines began daily nonstop service to Paris–Charles de Gaulle. This marked the first scheduled transatlantic route from Salt Lake City. In November 2008, Delta announced nonstop service to Narita International Airport near Tokyo, Japan, mostly as a result of Delta's merger with Northwest Airlines. The service began on June 3, 2009, the first nonstop from Salt Lake City to Asia. Between 2010 and 2011, the flights to Tokyo were seasonal, May to October. Delta has not operated the flight since October 2011. Three days after the Paris terror attacks, an Air France A380 traveling from Los Angeles, California to Paris, France was diverted to Salt Lake City International Airport due to a bomb threat on the aircraft. The aircraft was the largest plane to ever land at the airport. The airport workers had only 15 minutes to get ready for the emergency landing. On May 5, 2016, KLM began new, twice weekly nonstop service from Salt Lake City to Amsterdam, and increased service to three times weekly on July 4, 2016. It is the first transatlantic route from Salt Lake City served by a European-based airline. The service is intended to supplement the existing daily flight between Salt Lake City and Amsterdam operated by Air France KLM’s Transatlantic Joint Venture partner Delta Air Lines. A revised master plan was released in May 2006 for the airport and is available for the public to view at the airport's website. Future plans call for runway 17/35 to be realigned to more precisely parallel runways 16L/34R and 16R/34L. Plans also call for runway 16L/34R to be lengthened to 15,100 feet (4,600 m) from its current 12,002 feet (3,658 m). Plans for a fourth parallel runway west of 16R/34L are also shown, but is more than fifteen years away. In June 2010, the airport asked for public comments on the airport expansion as well as announcing the start of an environmental study of the master plan that had public hearings in the summer of 2011. In February 2012, the airport announced that construction would likely begin in 2013 and 2014, with completion slated for 2020. In 2021, the International Terminal and the concourses will begin demolition and build the new North and South Concourses. The expansion's details are deliberately being kept flexible to better adapt to changing conditions in the airline industry and are likely to change over the next 8–10 years. A top priority of the expansion will be to greatly increase airport buildings' resistance to earthquakes. As of March 2019 the new South Concourse, and Terminal are under construction. With the new airport structures visible. Due to the construction, The gates at Councourse E were demolished partly. Concourses G and F have been renamed from their former names of A and B as the new airport will have 2 two concourses named G and F. The structure of the new gateway is visible from terminal 2. The new parking garage is almost completed. And a new Truck stop with a Beans & Brews, and a Burger King has been constructed. The airport spans over 7,700 acres (3,116 ha) and has four runways. The runways are generally oriented in a NNW/SSE magnetic direction due to consistent prevailing winds in this direction. International Terminal has Concourse D and Concourse E. Arriving international flights only use gates D2, D4, and D6 in Concourse D, however. The airport handled 156,319 metric tonnes of cargo in 2008. Despite being the twenty-eighth busiest airport in the world in terms of aircraft operations, the airport still maintains a large general aviation presence. In 2008, 19% of aircraft movements at the airport came from general aviation traffic. This is in contrast to most large airports, which encourage general aviation aircraft to use smaller or less busy airports in order to prevent delays to commercial traffic. The airport is able to effectively handle both commercial and general aviation traffic largely in part to the airport's layout and airspace structure. Nearly all general aviation operations are conducted on the east side of the airport, away from commercial traffic. Additionally, smaller and relatively slower general aviation aircraft arrive and depart the airport in ways that generally do not hinder the normal flow of arriving or departing commercial aircraft. 2007 data shows there are 388 general aviation aircraft based at the airport. The airport has two Fixed-Base Operators, located on the east side of the airport. The airport has facilities for Air Ambulance, Law Enforcement, as well as state and federal government aircraft. Additionally, the airport is home to several flight training facilities, including one operated by Westminster College. The Utah Air National Guard operates what was previously named the Salt Lake City Air National Guard Base on the east side of the airport. In November 2014, the installation was renamed the Roland R. Wright Air National Guard Base after Brigadier General Roland R. Wright, USAF (Ret). On October 14, 1989, Delta Air Lines Flight 1554, operated with a Boeing 727, caught fire during the boarding process for a flight to Edmonton, Alberta, Canada while the aircraft was parked at a gate. Of the twenty-three people who were on the aircraft at the time, five sustained minor injuries. While all passengers and crew evacuated, the aircraft was destroyed. An investigation determined the fire started due to a malfunction with the passenger oxygen system. On November 17, 2015, an Air France Airbus A380 (recognized as Flight 65) en route from Los Angeles via Paris made an emergency landing at Salt Lake City International Airport due to a terror threat, only four days after the November 2015 Paris attacks in Paris, France.